Workflow is a general term describing a specific sequence of activities needed for completing a work task such as hiring employees, shipping production, or simply installing software. It is easily represented visually through a flowchart. 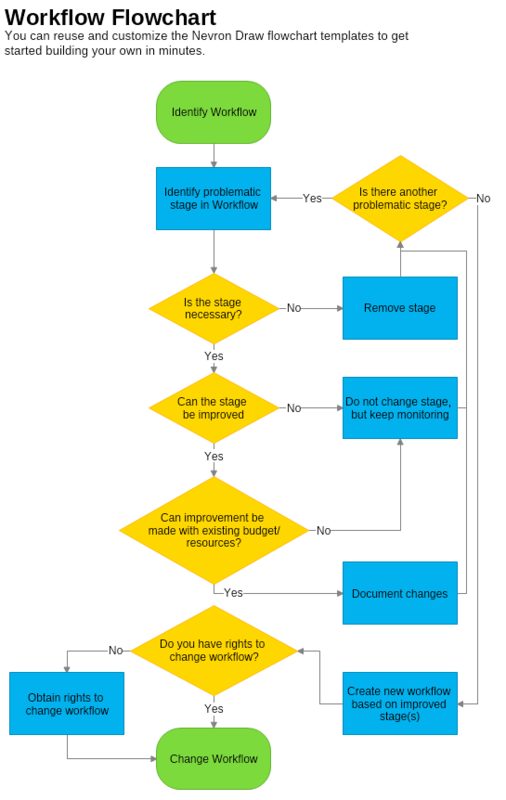 The Workflow Flowchart is a diagram that illustrates the work steps which need to be completed in the working process to gain the desired outcome. Each work task that requires a strict sequence of activities to be completed can be described using a workflow flowchart. This allows for keeping the correct order of actions in the working procedure. You can start creating your Workflow Flowchart with Nevron Draw quick and easy by downloading this template.